For the last few weeks, it has seemed that any discussion surrounding Universal's Snow White and the Huntsman was dominated by tabloid tittering over Kristen Stewart's much publicized affair with director Rupert Sanders. While I still maintain that Stewart is the weakest link in an otherwise strong film, it's sad to see such fine work reduced to the subject of such meaningless gossip and its potential to effect the film's inevitable sequel. In a summer typically dominated by sequels and franchise tentpoles, Snow White and the Huntsman offered a glimmer of originality, surprising many by becoming one of the summer's biggest hits without a built-in fanbase to support it. In the process it washed away any memory of Tarsem's bland take on the Snow White tale, Mirror, Mirror which was released only two months prior. My opinion of the film hasn't changed, if anything it has grown. The "Extended Cut" on the blu-ray isn't noticeably different, the 12 minutes of new footage adding very little (and good luck noticing it). The extras are also pretty standard behind the scenes featurettes, but perhaps most fascinating is a mock up trailer that Sanders created in order to pitch the film to the studio. It's interesting to see how the film has evolved, but also how clearly some of the imagery he came up with so early on remains so intact. The supplements are unusually heavy on the filmmaking process rather than the usual shots of actors praising each other, and it's refreshing to see them focusing on how the film was made rather than empty platitudes. Fans of the film will certainly be pleased. Just as the film itself was a bright spot in the summer movie going season, so too is the blu-ray release. 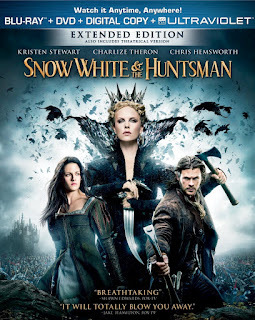 While not quite Lord of the Rings level work, Snow White and the Huntsman is nevertheless one of the strongest and most entertaining fantasy epics to come along in quite sometime, and now one of the most beautiful films of 2012 has been given one of the most gorgeous blu-ray releases of the year. Available on blu-ray and DVD tomorrow, September 11, 2012. I really liked this movie when I saw it in theaters. The visual style was right on being part period piece and part high fantasy. I also thought that Charlize Theron was a perfect Evil Queen, and her only fault was in fact being fairer than Snow White. I was talking to a coworker at Dish about the movie, and like you were noting she couldn’t get past the affair. It is sad that we must devolve into childish gossip when discussing art, aren’t there enough reality shows for people to get that out of their system? Those things aside I am excited to watch the movie again. I just put it in my Blockbuster @Home queue, and I hope to have it by Friday so I can watch it with the GF. She loves fantasy stories and I appreciate the lack of a heavy love story so it should make for a pretty good movie night.